Let’s just say our breakfasts have gotten a little out of hand. If you live in the west your breakfasts are probably rivaling some of the best desserts. But it’s OK because the waffle is topped with a strawberry and the carrot cake has carrots in it. And I definitely added extra eggs, used bananas instead of flour and added a cup and a half of raw honey because my #paleo breakfast is definitely healthier than yours. Even the spin on healthier western breakfasts revolve around adding less sugar. Chia puddings and sprouted granola made with half the amount of sugar as conventional breakfasts. Except half the sugar of a bucketful of sugar is still a lot of sugar. What if we had breakfasts not with half sugar nor healthier sugar, but no sugar? Let’s face it, most breakfasts aren’t the glamorous brunch-y gloriousness that pinterest tries to sell us. The white plate on the white mantelpiece with flowers and creamer and orange juice… yeah, maybe once a month. On a Sunday. Regular western breakfasts are made of grimmer stuff; sometimes had in pre-dawn to make the commute to work or school. They might be replaced by a cup of coffee. They might just not happen at all. Our breakfasts are the granola with the fruit with the sweetened yogurt grabbed on-the-go. What’s the deal with Korean breakfasts? Koreans don’t really do breakfast foods. 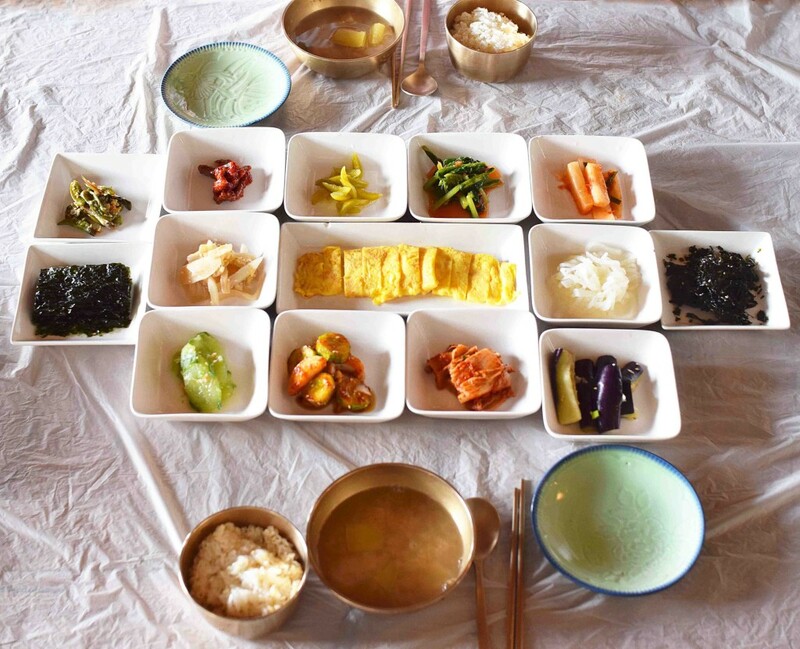 A traditional Korean breakfast might not look any different from what you had for dinner. They’ll break their fast with a little feast of rice, soup, fermented vegetables and a side of protein: eggs, fish, meat or tofu. Fish for breakfast? You bet. If it’s not an entire fish you’ve got to de-bone they’ll still manage to sneak seafood in their soup, kimchi or side dishes. It’s the stuff my nutrition teachers dreamed of: seaweed and fish galore. While visiting Jeonju my sister and I stayed at a hanok (traditional Korean house) and our lovely host produced a table-full of exquisite Korean foods. This was my second day in Korea and this was my breakfast. (Apologies for the chop sticks in the middle of the shot – I dived in eagerly before deciding to spare a second to shoot it). It was a balanced meal of starch, veggies, greens, fermented probiotic goodness and fish and eggs. My portion of the meal must have been around 400 – 500 calories, tops. (I didn’t finish the rice) Yet it got me going for hours, through walks and hikes. I remember eventually giving up on getting hungry and deciding to stop for lunch regardless as it had been 6 hours since breakfast. Nutrition talk aside, the meal was delicious and it genuinely felt good to have a savory breakfast. Exploring the country-side of South Korea, we got to experience the humbler breakfasts of farm folk. Fresh fish, harder to come by in some rural villages, gets replaced by farm fresh eggs and a wide variety of home-made kimchi and other fermented side dishes. Far from grocery stores and farmer’s markets, the family gets by with their assortment of fermented foods. By the chicken coop in a little terrace in the garden rested pots and pots of vegetables going through the fermentation process. This process preserves the food and adds friendly bacteria so that after a bountiful harvest the family would come together cutting and prepping crops for fermentation. These modest breakfasts are no less nutritious. 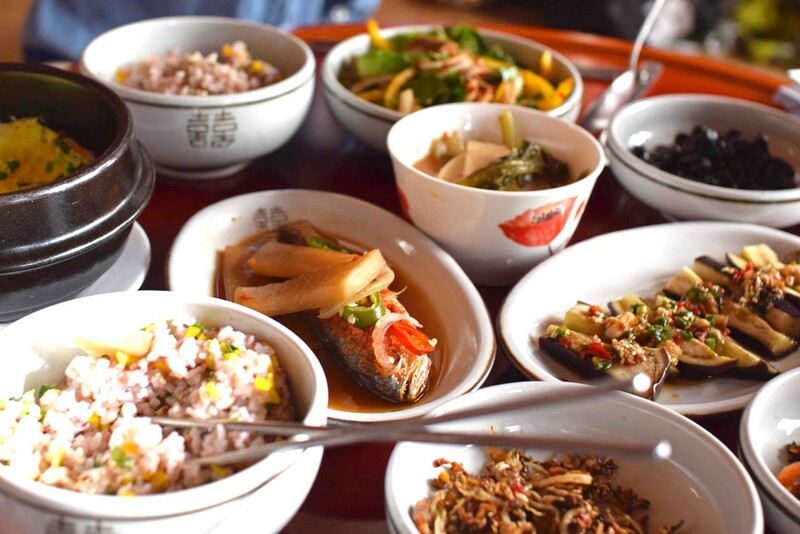 Mineral-dense fish broth is served accompanied by rice and the feast of side dishes. Each fermented dish bursts with it’s own unique flavor. We got to eat two-year-old kimchi (fermented cabbage) and sweet n’ sour plums; tastes so singular I could not find them anywhere else. These breakfasts are unfortunately less and less common in South Korea. Walking down the streets of Seoul you’ll find coffee chains and bakeries stacked one after another. More and more Koreans are adopting the western practice of simpler and sweeter breakfasts; trading their savory feasts in favor of pastries and coffee. Starbucks, introduced in South Korea in 1999, started somewhat of a coffee craze in the country that is still growing strong today. A study done on Korean consumption trends in 2013 showed the number of coffees brewed in the country more than doubled in the past decade. According to International Business Times a joint-study reported people in Korea drank coffee 12.2 times per week, while eating kimchi 11.9 times and white rice 6.9 times per week. 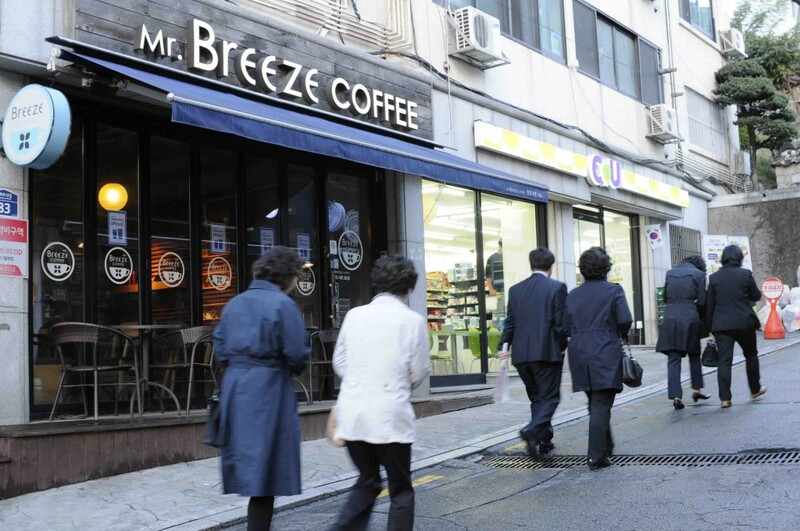 The average Korean drinks coffee twice a day, consuming more coffee than kimchi or rice. 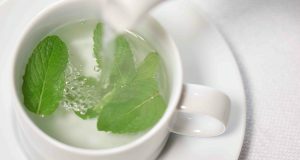 These are surprising statistics considering the country has traditionally drunk tea. It would seem that’s where we’re all headed. The world will converge in a uniformity of sugar-y breakfasts. The fast food & coffee chains won’t stop until they’ve caught ’em all and the natural human affinity towards sweets will always pave the road for them. 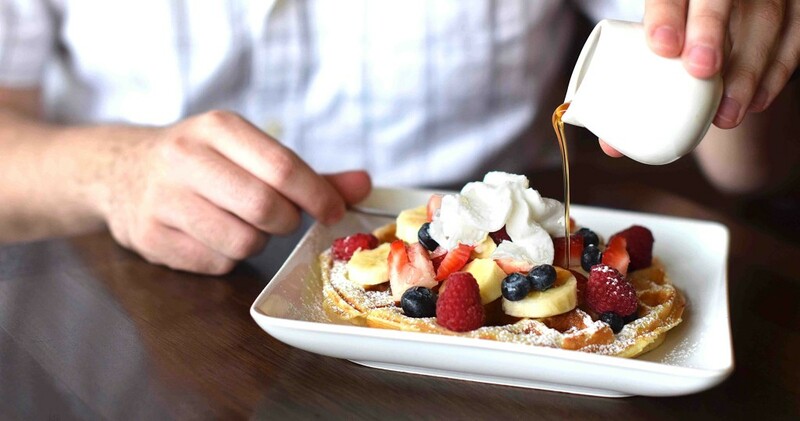 Sweet breakfasts have become so much of a norm that we barely even appreciate the indulgence. Imagine the same sugar allowance we indulge in the mornings except served as an afternoon snack. I know I’m more grateful for the 3pm treats than the breakfast tediums. Pancakes with syrup in the mornings are meh. Pancakes with syrup after lunch – holy bonkers what did I do to deserve this?? What if we halve our breakfasts and serve them as dessert? We don’t have desserts every day, but we do need a nourishing start of the day – and we need all 365 of those per year. I say let’s have more breakfasts like Koreans used to: find a way to incorporate fish or good proteins in the morning, add in a good chunk of veggies and maybe throw in some probiotics once in a while. You don’t even need to go Korean, ditch the muffins and stick to a culture’s traditional breakfast and you’ll be guaranteed a complete meal. 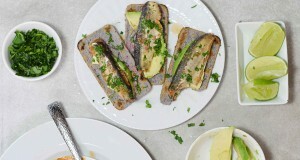 For recipe inspirations to eat more seafood check out my pinterest board: Fish for breakfast! In here in Sri Lanka the breakfast is taken with some rice and protein and veggies.It’s the tradition.But lot of people tend to take more short-eats and fast food for their ease.I think that’s sad truth of most nations.They just give up the good and embrace bad. In Mexico traditional breakfasts would include beans and corn tortillas and different types of accompaniment. Agreed! It’s a world wide phenomenon, trading in the good for the easy. Insightful post! Thanks for sharing :)!